DAAD Alumni & Friends subsidises certain special events (conferences, panel discussions, workshops) if these are in line with the objectives of the Association. The emergency fund provides fast, non-bureaucratic support for scholarship holders in difficulties through no fault of their own. and are based on cooperation between several institutions/sponsors. A model project is the discussion event “25 Years after the Fall of the Wall and the Monday Demonstrations in Leipzig” in autumn 2014. 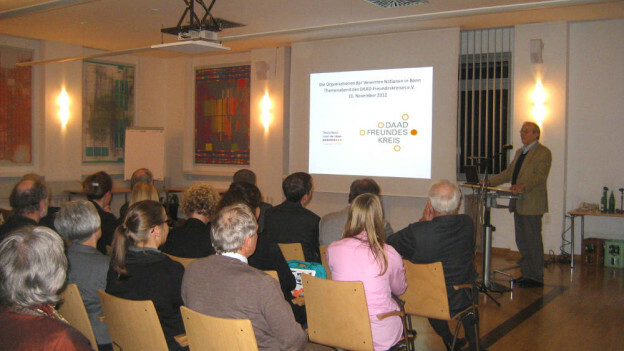 This was organised together with the University of Leipzig and the DAAD. Under certain circumstances, the emergency fund enables DAAD Alumni & Friends to support DAAD scholarship holders in difficulties. The benefits may well be very modest in each individual case, but the response is fast, which is often more important. If you are in difficulty, please contact our office directly.